Ladybird has a fairly distinctive appearance so easily distinguished from other insects. His body was shaped almost round with a pair of hard wings on his back. Hard on his back wings colorful, but is generally coupled with a striking color pattern spotted. The wings are colorful hard it is actually a front wing or wing elitra. Transparent and colored rear wing is usually folded under the front wing when not in use. When flying, flapping his wings behind him quickly, while the front wings are rigid cannot be packed up and stretched to increase lift. Hard front wings which could also serve as a protective shield. Ladybird is a friend to farmers because it preys on insects pests. 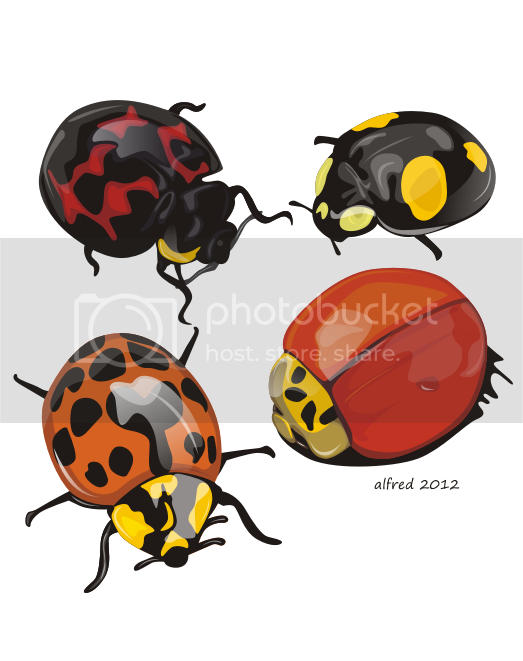 Before ladybird species, the better I draw it in the form of vector. Vector lady bird I created this using Corel Draw with transparency techniques. You can download the vector file lady bird. I had already prepared two formats, namely CDR format (Corel Draw) and PDF formats for users of other applications in addition to corel draw.